The beloved classic about a one-of-a-kind little girl who rules The Plaza Hotel. Ezra Jack Keats' Caldecott Medal-winning classic about a boy discovering the magic of first snowfall in New York City. The classic true story of a little red lighthouse eclipsed by the construction of New York City's George Washington Bridge. A quirky tour of New York City with sleek illustrations and witty commentary, from the beloved "This is..." cities series by Miroslav Sasek (first published in 1960). A uniquely New York alphabet book, featuring New York City photos. A Caldecott Honor book about the magic of a hot summer New York City night when the power goes out. The story of a real phonebooth on the corner of West End Avenue and 100th Street, who proves its worth, despite having been largely abandoned in the age of cell phones. Father-son author-illustrator duo Walter and Christopher Myers pay tribute to the history, culture, sights, and sounds of Harlem through poetry and art. A boy and his father explore the city. A preschooler takes readers through her Brooklyn routine. A boy and his grandmother take readers on a tour through their New York City Chinatown neighborhood. A boy visits his grandmother and overcomes his fears of the city. A young New Yorker tells a friend from the midwest about her city, with lavish illustrations by folk artist Kathy Jakobsen. A prize-winning 1970 classic, recounting humorous, fantasy-laced tales about the adventures of a young new yorker named Mitzi and her little brother. The adventures (originally published in 1963) of a little boy thwarted at every turn as he attempts to make his way to Times Square. Illustrations by Maurice Sendak. The true story of PT Barnum's famous 1884 stunt, in which he tested the strength of the recently constructed Brooklyn Bridge by leading a herd of circus elephants across it. The Caldecott Medal-winning true story of aerialist Philippe Petit's daring 1974 highwire walk between New York City's World Trade Center towers. Maira Kalman's true story of a fireboat that came out of retirement in 2001 to help New York City in a time of need. The Caldecott Medal-winning story of a depression-era girl living in Harlem who takes an imaginative journey over the rooftops of her neighborhood and city. A New York City love story about an oboe-playing crocodile and a jazz-singing deer brought together by their shared love of music. A pair of cardinals lose and find each other in Christmas Season New York. 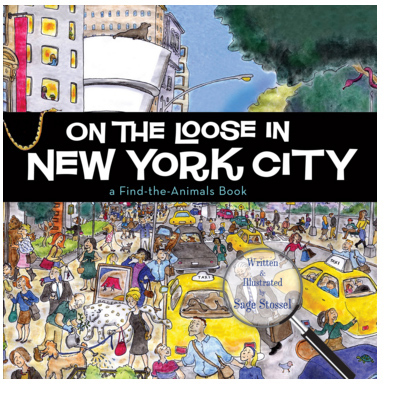 On the Loose in New York City The animals of the Central Park Zoo have escaped into the city, where children have to find them in iconic New York City scenes.